Last Wednesday night at the Englert Theater and FilmScene, I got into the Halloween spirit by reflecting on the origins of modern realist and horror cinema. Man With a Movie Camera played at the Englert at 7:00pm. It featured a live soundtrack by the Alloy Orchestra. 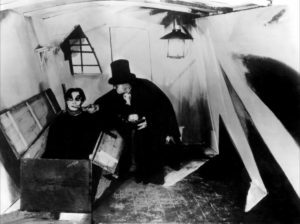 At 10:00pm, FilmScene showed The Cabinet of Dr. Caligari, which was scored by MacMillan & Spengler, as part of its series, Late Shift at the Grindhouse. Two silent films, two original scores, one fantastic night. The Englert Theater was the perfect place to watch Man With a Movie Camera. Here we have a classic known to pretty much anyone who studies film. 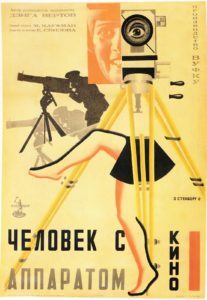 Man With a Movie Camera is an attempt at unabashed realism, yet for all that is often surreal. In the film, we see people going about their regular routines: sleeping, waking, working, commuting, marrying, divorcing, being born (literally), and dying. 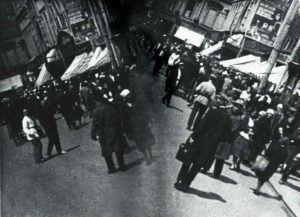 The film is a short summary of life in the Soviet Union in the 1920s. It is self-consciously self-reflective. We see the film, the film being filmed, the filmmaker being filmed, as well as people editing and viewing the film being filmed. It is an attempt to show the ordinary everyday, but does it in an extra-ordinary way. While there is ostensibly a “no tricks” element to the film—it self-consciously eschews the aesthetic of theater, the employment of actors, the use of sets, etc—it also experiments with animation. For instance, the tripod at one point stands “itself” up and the camera attaches “itself” to the tripod. 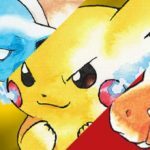 It also uses other kinds of manipulation. Occasionally we are given two screens bleeding into one another at various angles, and occasionally a shot is played in reverse. The film is proud of its lack of “traditional” filming techniques. It is at the same time one of the earliest films that resembles a documentary, yet there is no over-arching narrative, as we have come to expect of documentaries these days (for better or, usually, worse). A perfect case study for media, it wants to showcase a single “medium” (film) without any intervening “intermediaries” (like narration or commentary). Man With a Movie Camera is also a reflection on and of modernity. It uses various themes to accomplish this, like the theme of spinning (conveyed by the spinning wheels of the train, the bus, the horse-drawn carriage, the sewing machines, the factory machines, the motorcar, the camera itself). It makes one wonder, are we literally just spinning our wheels? It also has very candid moments, and moments that remind us how fragile and fleeting is life. For instance, one wonders what became of the child born on-screen in the middle of the film. Intended to film “life as it is,” it nevertheless becomes necessary to weave some sense into the whole hurly-burly, which is why the film is separated into parts. There are of course more in-depth analyses than mine. 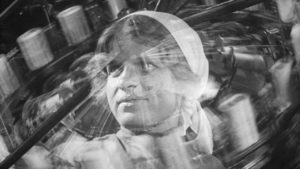 The Alloy Orchestra has come to Iowa City once a year for the last few years, scoring various silent classics that film students have been forced to watch, analyze, and understand for years. 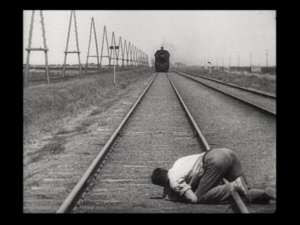 Their score for Man With a Movie Camera followed Vertov’s notes to the composer. While they have the advantage of using synthesizers that Vertov’s composer likely did not, they also utilize found metal for much of the performance, known as their infamous “rack of junk.” Their score was more than a little interesting, and followed the film quite closely. In one place, when an orchestra appears on screen, their score believably translated what seemed to be happening on screen into live music for the audience to hear. It is interesting to remember that in filming, the cameraman had to actually spin that reel in order for the filming to take place. This gives the film a natural rhythm. Alloy Orchestra found this rhythm, I believe, and stayed in its pocket through the entirety of the film. 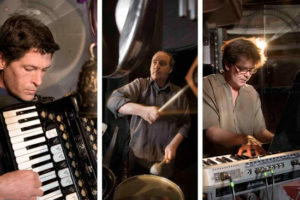 Alloy Orchestra have performed at various prestigious film festivals, including The San Francisco Silent Film Festival, The Telluride Film Festival, The Louvre, Lincoln Center, and the National Gallery of Art. At the end of the film, which is visually a rather “loud” compilation of various scenes throughout the film, Alloy Orchestra conjured up a cacophony of their own, which was almost deafening, so that when the film ended, and the noise stopped, we were all left with a deafening silence in which to ponder what the film was supposed to mean, and how many levels of analysis we were supposed to apply to the film. Does the realism of the film cover some things up? Is it meant to be purely realist, or to conjure the imagination? Is the depiction of the factories, the influence of which we see in films like Baraka or Koyaanisqatsi, meant to be value-neutral, or to reflect positive or negative value judgment? 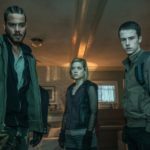 Related: Why it is important to use film set security? In many ways, the next film, The Cabinet of Dr. Caligari, shown at Iowa City’s FilmScene, is the opposite of Man With a Movie Camera. It involves hired actors, highly stylized sets, tells one complete narrative throughout the entire film, and utilizes various dramatic strategies adapted from the stage. We should expect nothing less from a production by F. W. Murnau, who brought us Faust and Nosferatu (the latter of which was also scored by Alloy Orchestra at the Englert in 2012). 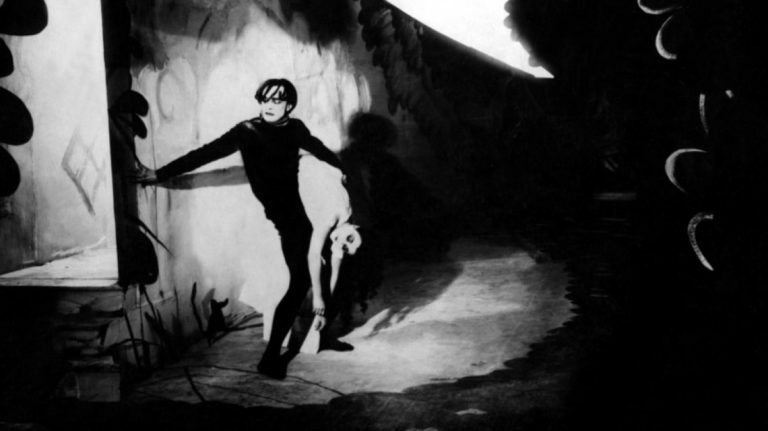 The Cabinet of Dr. Caligari follows the good doctor and his somnambulist (sleep-walker) Cesare, who has been sleeping for twenty years but who can be commanded by the good doctor to “wake” and to walk around for the nice people. After a series of increasingly horrible murders takes place, suspicion is cast upon the good doctor and especially his somnambulist, and the truth begins to emerge. Dr. Caligari feeds his somnambulist. Where Man With a Movie Camera is realist, The Cabinet of Dr. Caligari is surrealist. Where Man With a Movie Camera lends itself to the crash and bang of various cymbals and found hunks of metal, The Cabinet of Dr. Caligari is more suited to the eerie thromb-whomb of the analogue synthesizer. The live score from MacMillan & Spengler (two locals of the Iowa City music scene) was perfect for the film. It was creepy, surreal, and provoked a sense of mystery and wonder just as the film does. For those not familiar with MacMillan & Spengler, they have a mixture of rare and classic instruments. MacMillan is in charge of a wall of synthesizers with cables strewn all about & various lights blinking to the tempo, and Spengler is in charge of the organ, keys, and percussion. Both take turns on various sound effects. The sound was at times heavy and oppressive, at other times atmospheric and light, but always, always creepy: just like the film. The rhythmic pulse of MacMillan’s synthesizer timed to the rhythm of the film extremely well. The thematic melodies eked out by Spengler lent a special eeriness to the occasion. The study of the sub-conscious had only just begun at the time The Cabinet of Dr. Caligari came out, and the idea that people can be controlled through hypnosis, utilized in this film, will become a staple of the film industry for decades to come. It also is a convenient locus for those interested in Tim Burton’s influences. The stamp of F. W. Murnau is definitely found in many of Burton’s films. While I loved the scoring that MacMillan & Spengler did for The Cabinet of Dr. Caligari, I also have a couple of friendly suggestions for them. When Dr. Caligari is introduced, they provided a wonderful theme for him that was creepy as hell. I thought they could have utilized that theme in other places where the good doctor shows his creepy, smug face. 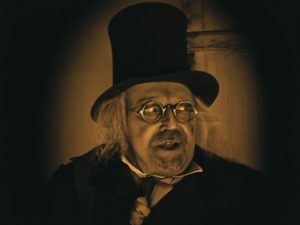 The music they played for the fair at which Dr. Caligari first reveals his cabinet of mystery was perfect when it comes to creepiness, using an old-timey organ sound that matched the organ-grinder really well. When we return to the fair the next day (after a horrible murder takes place), the creepy organ-grinder music is replaced by something else, and here I thought that they could have repeated but varied the organ-grinder theme to a more minor tone to provide a heavy, sweeping creepiness that also brought us back to that earlier theme. However, the decision to treat each scene completely individually also worked musically, because it works with the fundamental disconnect in the narrative of the film, which I won’t reveal here because it’s a major twist in the film. This would be a major spoiler & if you haven’t seen it, I won’t ruin it, because I highly recommend you see this film for yourself. 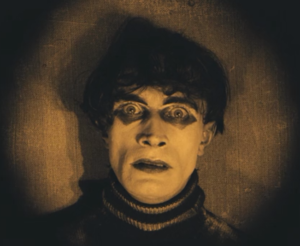 Conrad Veidt as Cesare, the somnambulist in The Cabinet of Dr. Caligari. 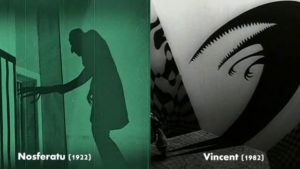 In sum, these films are a wonderful experiment in modernity in all its various aspects, from realism to surrealism to expressionism, from cabinets of curiosity to the wonders and horrors of industrial machinery, from existential dismay conveyed through nervously smiling faces to the dread and horror of realizing the true potential of one’s darker nature—willingly or unwillingly. The scores provided by Alloy Orchestra and MacMillan & Spengler were so good it was easy to forget—but then also easy to remind oneself—that it was happening right in front of one.